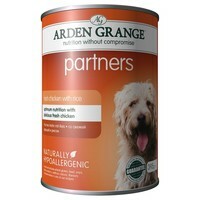 Arden Grange Partners Adult Dog Food (Chicken & Rice) is a complete hypoallergenic diet for all breeds of dog over 9 months of age. Containing a high percentage of delicious fresh chicken, Arden Grange Partners is a wholesome and nutritious diet filled with vitamins and minerals to provide your dog with the foundation of health and wellbeing. My Westie had tummy problems sickness. Changed her to Arden Grange Chicken and Rice marvellous results. She is a fussy eater but I feed her three small meals daily and she loves it licks the bowl clean every time. Had no sickness in four weeks one happy dog and owner. Would highly recommend , good price too. Had to find a hypoallergenic food for Labrador after he developed stomach problems - also had budgetary considerations. Arden Grange won hands down for economy reasons - best quality food for best price. Also my Lab is a very fussy eater yet he loves his arden grange and licks his bowl clean. Better than that he also has a happy stomach now too. Would highly recommend it and a very friendly company to deal with as have a vetinary nurse who you can email queries to, though cheapest to buy from VetUk!